The history of the Lincoln Highway in Ohio officially begins September 14, 1913, at the announcement of the "Proclamation of the Route of The Lincoln Highway." Conceived by its founders as "a continuous connecting improved highway from the Atlantic to the Pacific," this first coast-to-coast automobile route began in New York, and ended 3389 miles westward in San Francisco, passing through a corridor of the United States somewhat similar to the route of today's Interstate Route 80. The original Lincoln Highway route in Ohio was to follow much of Main Market Route Number Three, which connected several county seats across the north central part of the state by way of the best roads at that time. As listed in the proclamation, these cities included Canton, Mansfield, Marion, Kenton, Lima and Van Wert. Also on that route, but not listed, were the county seats of Lisbon, Wooster and Ashland. Three weeks later, Henry B. Joy, president of the Lincoln Highway Association, announced a "correction" to the initial route for the portion between Galion and Lima. At that time, the county seats of Marion and Kenton were removed from the route, and the county seats of Bucyrus and Upper Sandusky were added to the route. This route change was not received well by the citizens of the bypassed cities, and ultimately led to the creation of the rival Harding Highway. Their attempt to get back on the transcontinental route began one of the most colorful chapters of Lincoln Highway history in OhioCone that was not completely written until the compromising designations of U.S. 30-North and U.S. 30-South were dropped in November 1973. Through the next decade, officials of the Lincoln Highway Association continued to revise the route in a continuing effort to establish the best and shortest path across Ohio and America. The change which affected the most towns and cities occurred in June 1919, when the notorious zigzagging route through Forest, Ada, and Lima was finally abandoned in favor of a straighter route through Williamstown, Beaverdam, and Cairo. The revision was prompted by the coming of the U.S. Army's Transcontinental Motor Convoy in July. In laying out their proposed route for this coast-to-coast convoy of large trucks and assorted military vehicles, the army engineers "pointed out to [the association] unmistakenly that [they] should correct the error in routing in [Ohio]." The association did not necessarily regard the routing up to that time as an error, because "the north route via Williamstown and Beaverdam had not been adequately improved to carry the traffic." In fact, the changing of the Lincoln Highway to that north route had been considered by the directors "for some time," and after the officers of the association had inspected the north route that season, did agree to the change. The north route was "shown to be in every way, except width, equal to the present route, which is considerably longer, and moreover, full of turns." The north route also included "the longest section of The Lincoln Highway between the two coasts without a turn." However, in the 1924 edition of The Complete and Official Road Guide of the Lincoln Highway (hereafter, the Official Guide), the 40 miles between Upper Sandusky and Gomer is called "the worst section between New York and Chicago." Local newspaper accounts covered the story of the army convoy as it made its way across Ohio. Overnight stops were made in East Palestine (July 12-13), Wooster (July 14), Bucyrus (July 15), and Delphos (July 16), all with much pomp and circumstance. An extra night in East Palestine followed a day of rest on Sunday. Although it was not on the official route of the Lincoln Highway, East Palestine was on the route of a popular detour between Rochester, Pennsylvania, and Canton, Ohio, that also passed through the cities of Salem and Alliance. Not coincidentally, East Palestine was also location of the country homestead of tire magnate Harvey Firestone, who had a keen interest in the progress of the convoy. The convoy also made a significant diversion between Ashland and Mansfield by using a popular detour route through Olivesburg. Unfortunately, one of the army tank trucks crashed through a bridge in Olivesburg, which would delay the convoy's arrival that day in Bucyrus. Fortunately, the army engineers were up to the task, reportedly leaving the town that day "with a sound, new bridge where the old one was." Two other major changes in the route of the Lincoln Highway took place between 1918 and 1921, when the sections east and west of Bucyrus were relocated. Between Mansfield and Bucyrus, the original route through Galion was abandoned in favor of a route through Crestline and Leesville. Between Bucyrus and Upper Sandusky, the town of Nevada was removed from the route after a new brick roadway was opened through Oceola. Parts of this road were ceremoniously opened in multiple phases, with a brick pillar dedication becoming a popular part of each event. These new routings through Crawford County resulted in the creation of one of the most significant portions of the entire transcontinental route. It is here that local interests, led by State Consul John E. Hopley, began to erect the wonderful brick pillars which memorialize the Lincoln Highway and several of the leaders of the Lincoln Highway Association. Four of these monuments are still standing today. In Crestline, at the intersection with Clink Boulevard, there is a pair of brick pillars which were originally dedicated in 1922, and restored by the Mid-Ohio Chapter of today's Lincoln Highway Association in 1993. The monument on the southwest corner of the intersection is dedicated to Austin F. Bement, vice-president and secretary of the Lincoln Highway Association, and the monument on the southeast corner is dedicated to J.F. McMahon, first Lincoln Highway consul in Crestline. A third monument is about 2.6 miles east of the courthouse in Bucyrus, at the Stewart Cemetery. This pillar was originally erected on what is now State Route 19, and was dedicated in 1918 to E.J. Songer, county consul. It was moved to its present location after the route of the Lincoln Highway was revised. The fourth pillar is one mile easterly from the crossroads in Oceola, near milepost 2 of U.S. 30 in Crawford County, and is the only one of the four original pillars that does not have a plaque of dedication. 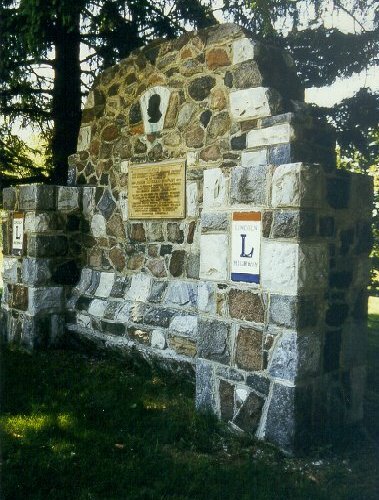 The Songer Marker is one of four original brick pillars along the Lincoln Highway in Ohio. This pillar is just east of the Bucyrus Bypass, at the northwest corner of the Stewart Cemetery. Also of significance in Bucyrus is the large stone memorial to John E. Hopley and the stone pillar nearby. These stone memorials were built after Hopley's death in 1927, and are composed of boulders delivered from several states, plus England and Uruguay—where Hopley had served as United States consul. 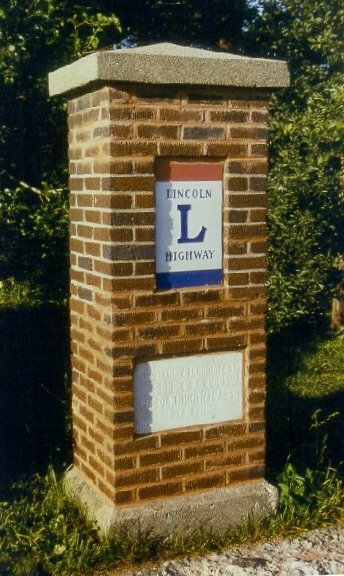 Like all of the brick pillars, both memorials feature the traditional red, white and blue plaques, with the large blue "L" and blue "LINCOLN HIGHWAY" lettering on the center white part of the plaque. Hopley was a champion for "Good Roads" everywhere, and was unquestionably the most enthusiastic promoter of the Lincoln Highway in Ohio. He served as state consul from the earliest years of the Lincoln Highway Association to the time of his death, when he was succeeded by his brother Frank. The Hopley Memorial in Bucyrus is one of the most impressive Lincoln Highway monuments along the entire transcontinental route. It was dedicated in 1929 to John E. Hopley, the Lincoln Highway Association's first state consul for Ohio. In 1923, the Ohio Department of Highways established the system of state routes that is still in use today. This new system of routes should not be confused with the network of inter-county highways which had been designated in 1912. Adding to this confusion of numbers and nomenclature is the fact that in the several years prior to 1923, the inter-county highways were marked in the field as state routes, reportedly because "INTER-COUNTY HIGHWAY" took up too much space on the sign. Markings such as this were the first use of highway number signs in Ohio. The typical sign, originally painted on utility poles and such, featured black numbers and lettering ("STATE ROUTE" above the number; "OHIO" below the number), all inside a black outline of the state, and all painted on a white background. In 1923, when the first iron signs were cast and posted for the new state route numbering system, that same pattern was continued, except the black color was apparently altered to dark blue. Other evidence from museums and map collectors indicates that both black-on-yellow and white-on-blue signs were used in later years. Typically, the newer and longer state routes of the 1923 system were created by joining together several of the shorter inter-county highways. For example, the route of the Lincoln Highway across Ohio was designated State Route 5, and was made up of fourteen inter-county highways, such as I.C.H.#512 (Delphos-Upper Sandusky Road) and I.C.H.#418 (Van Wert-Delphos Road). The Lincoln Highway route described in the 1921 and 1924 editions of the Official Guide would have traced State Route 5. Today there is a newer State Route 5 in northeastern Ohio, but that highway has nothing to do with the original State Route 5. In the mid-1920s, the federal government saw the need for a national network of numbered routes. The Lincoln Highway had inspired the creation of several other named transcontinental routes, plus a myriad of regional auto trails. Like the Lincoln Highway, these routes and trails were typically marked with a series of symbols and colored stripes, usually on utility poles, but also on anything else that could be painted. With hundreds of different trails throughout the United States—many overlapping—the resulting maze of symbols and colors caused more confusion than convenience. Thus, the now-familiar federal highway shields started going up, and the signs with symbols and stripes started coming down. The Ohio Department of Highways map dated August 1, 1926, reported that "these [federal] numbers will supersede Ohio [state route] numbers in field in 1927 on the routes as shown on this map." In 1926, the federal government designated much of State Route 5/Lincoln Highway as Federal Route 30, or more popularly, U.S. Route 30. However, there was one section of State Route 5/Lincoln Highway between Mansfield and Delphos was not designated as U.S. 30. Ironically, the important U.S. 30 designation was given to the Harding Highway, putting Galion, Marion, Kenton and Lima back on an east-west route of national prominence—years after each city had been removed from the Lincoln Highway. The original U.S. 30 designation lasted until May 1931, when the last remnant of State Route 5 was apparently improved enough to merit the new federal designation of U.S. 30-North. At the same time, the original U.S. 30 was designated as U.S. 30-South. This cumbersome compromise of numbers and letters lasted until November 1973, when the north route assumed the primary designation as U.S. Route 30, and the south route was renumbered as State Route 309. At that time, much of the north route had become a four-lane limited access highway, bypassing most of the larger cities on old 30-North. By the end of 1927, the Lincoln Highway Association had moved to cease "active and aggressive operations." Its cause for good roads was now in the hands of state and federal officials. Their thoughts quickly turned to another way of perpetuating the memorial premise of the Lincoln Highway. Despite a national policy that now banned the types of signs previously used for the old routes and trails, the association "petitioned and was granted permission to mark the highway...based on the idea that it wasn't planning to mark the highway as a road...but as a memorial to Abraham Lincoln." The marker that was proposed and approved was a four-foot tall (above ground) concrete post, to be set at critical points along the highway. Of the nearly 2500 posts to be set on the transcontinental route, 241 were to be set in Ohio. Although never intended as mileposts, the spacing of the markers in Ohio does coincidentally average one post per mile. On September 1, 1928, Boy Scout troops from cities and towns on and near the highway performed the task of placing the posts. The location of each post had been carefully mapped out earlier that year by Gael Hoag, who had been field secretary of the Lincoln Highway Association since 1920, and who probably knew the road better than anyone at that time. 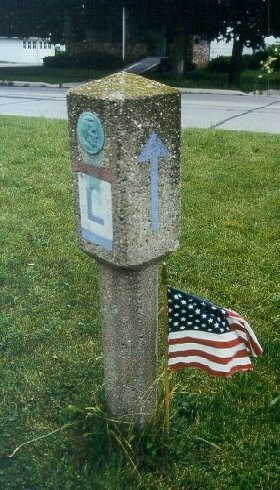 Each of these markers had a smaller version of the traditional red, white and blue sign (but only with the large blue "L") facing the edge of pavement, and also had blue directional arrows facing traffic, either on one side only, or on both sides, depending on whether the approaching movement was a continuation or a turn. 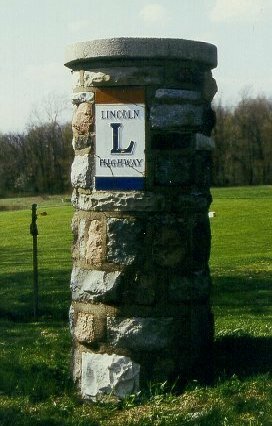 A medallion with a bust of Lincoln and the inscription "This highway dedicated to Abraham Lincoln" was also embedded into each concrete post. One of 241 concrete posts that were "simultaneously" set in Ohio by the Boy Scouts on September 1, 1928, along the highway "dedicated to the memory of Abraham Lincoln." Only three posts in Ohio remain at or near their original positions—in East Canton, near Dalton, and in Mifflin. Although more than two dozen of the original concrete posts can still be recovered across the state (including some in excellent condition at both museum properties and private residences), it is believed that only three are at or near their original positions. From east to west, these posts are located as follows: (1) on the south side of Nassau Street, one-half block west of the Cedar Street intersection, in East Canton (formerly Osnaburg); (2) on the south side of Old Lincoln Way, 100 yards west of the Kidron Road intersection, in Wayne County; and (3) on the south side of Maine Street, just west of the junction with State Route 603, in Mifflin. In 1998, a concrete post was found by three boys walking in a woods west of Robertsville, and that recovered post was placed near an original post location in downtown Minerva. Several concrete post replicas cast by Richard Taylor of the Mid-Ohio Chapter have also been placed along the route. Just prior to the setting of the posts, two last changes had been made in the route of the Lincoln Highway across Ohio. In March 1928, the association approved a rerouting between Pittsburgh and East Liverpool, which avoided a slow and congested route on the north side of the Ohio River. The new route passed through the towns of Crafton, Imperial, and Clinton, in Pennsylvania, and passed through the city of Chester, in West Virginia. As a result of this change, The Mountaineer State became the thirteenth state on the route of the Lincoln Highway—just in time to be monumented by the concrete posts in September of that same year. Remarkably, three of these posts can still be found within blocks of each other in Chester. The other route change approved by the Lincoln Highway Association in March 1928 was the abandonment of the Ashland Route between Wooster and Mansfield. This particular change removed New Pittsburg, Rowsburg, and Ashland from the route, and added Reedsburg, Jeromesville, Hayesville, and Mifflin to the route—a revision which resulted in a distance reduction of three miles. The marking of this new route was apparently delayed until that time when the concrete posts were to be placed by the Boy Scouts. Still, State Consul Frank Hopley had somehow not been advised about the approved revision, stating that he "was not a little surprised to note [that the route] had been changed east from Mansfield." Backing up a bit, the year of 1927 saw the first marking of U.S. 30 in the eastern part of Columbiana County, which for some unknown reason, had no effect on the route of the Lincoln Highway. The new federal route followed Market Street and Dresden Avenue out of downtown East Liverpool and into California Hollow, and then continued to and through the community of Cannons Mills. It rejoined the transcontinental route at a point that became known as California Hollow Junction. Today that point is the intersection of East Liverpool Road (County Road 425) and Old Lincoln Highway (County Road 451). However, this first alignment of U.S. 30 near East Liverpool was not the route marked with the concrete posts. The roadway that was marked was an abandoned part of State Route 5 which had been renumbered as State Route 267—a route which still exists today, although with modifications near the freeway interchange. As a result, that portion of the Lincoln Highway designated as State Route 267 was the only part of the 1928 route in Ohio which was not on either U.S. 30 or State Route 5. Thus, the route of the Lincoln Highway in Ohio that was marked by the Boy Scouts was (from east to west) as follows: State Route 267 from East Liverpool to California Hollow Junction; U.S Route 30 from California Hollow Junction to Mansfield; State Route 5 (which became U.S. Route 30-North in May 1931) from Mansfield to Delphos; and U.S. Route 30 (again) from Delphos to the Indiana line. In an administrative action of the State Director of Highways, dated August 1, 1930, most of the route described above became the official route of the Lincoln Highway, insofar as the State of Ohio was concerned. This action granted approval of a resolution adopted by the commissioners of ten of the eleven Lincoln Highway counties in Ohio, which proposed to designate portions of U.S. Route 30 and all of State Route 5 as the Lincoln Highway. The only questionable variation from the route that was marked by the Boy Scouts is the apparent acceptance of the recent U.S. 30 rerouting near East Liverpool as part of the Lincoln Highway, and not State Route 267. A careful reading of the approved resolution also reveals that as revisions were made to the routes of what was then U.S. Route 30/State Route 5, the Lincoln Highway would move so as to always remain with those routes. Today, that would mean that wherever the route of U.S. 30 happens to be at a given time (State Route 5 no longer exists in this corridor), so also is the route of the Lincoln Highway. However, based on the nomenclature used in most Ohio towns and counties, it would seem that the 1928 route is the one route that is truly recognized and remembered as the traditional route of the Lincoln Highway. However, driving the old Lincoln Highway in Ohio is no longer a simple matter of following U.S. Route 30. Most of the typical two-lane route marked by the Boy Scouts in 1928 has been replaced by extensive sections of four-lane divided highway. Many parts of the old Lincoln Highway are now county roads or township roads. Other portions of the early coast-to-coast route are in various states of abandonment, depending on their use and when they were abandoned. Several such portions are now short driveways or lanes on private property. Thus, the Lincoln Highway tourist of today will need a detailed guide such as this to find many of the older alignments. Other reliable companions for this journey are the official county maps available at each county engineer's office, and the quadrangle sheets of the United States Geological Survey. The old 15-minute series of USGS maps is especially valuable for tracing the original locations of roadways. In Stark County, for example, there are four separate sections of old alignment, each now marked as Cindell Street. One particular section, immediately north of and parallel with U.S. 30 near the Sam Krabill Avenue intersection, features one-half mile of original brick. Another remnant in Stark County with more than one mile of exposed brick is Baywood Street, which bears southeasterly from the town of Robertsville. 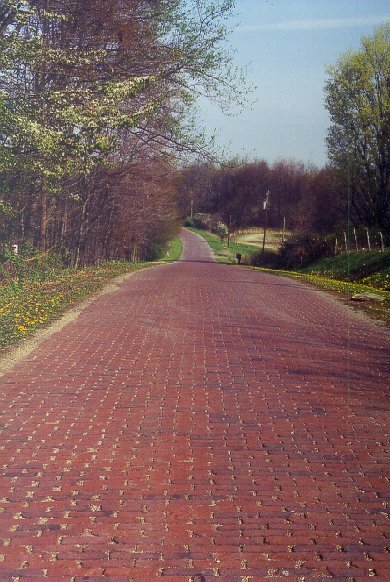 Baywood Street between Minerva and Robertsville is one of two significant stretches of brick roadway in Stark County. A section of Cindell Street near U.S. 30 milepost 25 is another. Among the obvious older sections are those roads that still have "Lincoln" or "30" in their names. There is both an Old Lincoln Highway and Old 30 Road in Columbiana County; both a Lincoln Way and Old Lincoln Way in Wayne County; and County Road 30-A in Ashland County. 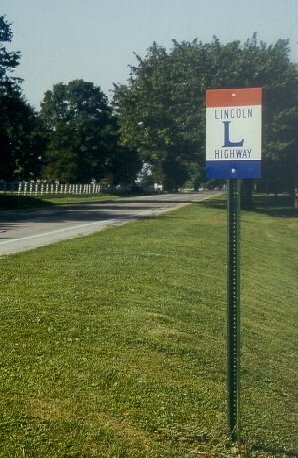 In Crawford County, Allen County, and Van Wert County, the Lincoln Highway name is the legal name. In the town of Hanoverton, a short remnant there is marked as Lincoln Street. Another Lincoln Street is the Stark County designation for U.S. 30 between Minerva and East Canton the reconstructed route that rendered the Cindell Street and Baywood Street remnants. The towns/cities of Lisbon, Minerva, and Massillon all have thoroughfares still known as Lincoln Way, and the main street of the town of Dalton is Old Lincoln Way beyond the corporation line. In late 1994, the Van Wert County Commissioners officially changed the name of Ridge Road to Lincoln Highway. This is one of over fifty new Lincoln Highway signs that were erected after the name change was made. Similar signs have since been posted elsewhere in the state. Dalton, now with a population of about 1400, appears to be the first town or city in Ohio to have a four-lane U.S. 30 bypass built around it. Based on this author's research of official Ohio highway maps, this project was completed in the early 1950s. The crossroads community of Williamstown and the congested downtown of Mansfield were both bypassed with similar projects in the late 1950s. Also completed in the 1950s was the Ohio Turnpike/Interstate 80, which diverted transcontinental traffic across Ohio from U.S. 30 to a more northerly route. The 1960s saw major four-lane construction in Columbiana County northerly from East Liverpool, and similar construction in central and western Van Wert County, including a bypass around Van Wert. Wooster was also bypassed in this decade with a new four-lane alignment. The maps of the early 1970s show that limited access sections were opened around Massillon and around Bucyrus, and through Allen County from Beaverdam to Delphos. An impressive new U.S. 30 bridge (Jennings Randolph Bridge) was opened across the Ohio River between Chester, West Virginia and East Liverpool, Ohio, in November 1977. In the late 1970s, limited access sections were opened through the suburban community of Ontario (west of Mansfield), and around and beyond the city of Delphos. The 1980s saw four-lane U.S. 30 creeping eastward to Belden Avenue in Canton, and additional construction at East Liverpool in the Third Street corridor. In 1993, the last leg of a bypass route around Upper Sandusky was opened to traffic. 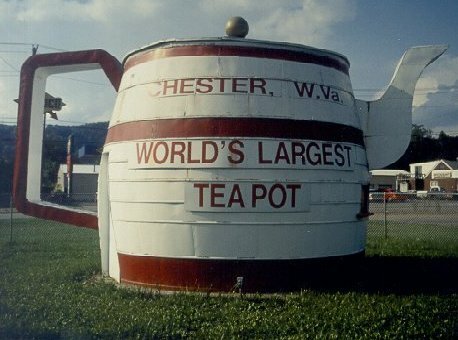 Just across the Ohio River from East Liverpool is the World's Largest Teapot. The Lincoln Highway arrived in West Virginia in 1928, and 3 of the 8 concrete posts set here can still be found in Chester. Since the late 1990s, the office calendar has regularly been marked as several groundbreaking and ribbon-cutting ceremonies have been scheduled across the state for the newest segments of four-lane U.S. 30. On December 19, 1997, groundbreaking took place for the construction of eight miles of limited access highway between State Route 235 north of Ada and the existing interchange area near Beaverdam. Through his professional status as a licensed surveyor, the author had the privilege of signing and sealing the right-of-way plans for the project in 1995, and was even more pleased to attend the official opening of the highway on December 22, 1999. Five years later, another eleven miles of expressway were opened between Bucyrus and Upper Sandusky. The gray and cold of a snowy morning on December 14, 2004 did not keep a crowd of nearly 200 people attending this ceremony. With Governor Bob Taft serving as keynote speaker, nearly all of that number crowded shoulder-to-shoulder inside a tent that had been set up at an impressive and unsurpassed rest area facility built along the eastbound lanes. With a spacious modern building and generous parking lot, truckers and other travelers will find this a welcome stop near the midpoint of an increasingly important commercial route across Ohio. The author was again in attendance when the long-awaited and much-anticipated fifteen miles of new four-lane highway was opened between Ontario and Bucyrus. Despite the 85-degree heat that prevailed on August 4, 2005, a crowd of over 250 people sit or stood for an hour under a large tent that was pitched directly on the new eastbound lanes near Bucyrus, while dignitaries including Senator George Voinovich thanked everyone and anyone for a job well done. With the modern highway cutting an efficient new path south of Crestline and north of Galion, the potential for new economic development in this part of Crawford County is a great positive—almost as much a positive as finally being able to drive through Crestline without being delayed by a stop-and-go convoy of big rigs. Just four months after that ribbon-cutting event, eight more miles of new U.S. 30 were opened in Wayne County east of Wooster. The temperature was a mere 9 degrees on December 19, 2005, but a heated tent helped warm some of the crowd of 200 people, which included long time Mid-Ohio Chapter President Mike McNaull. However, things reportedly cooled down immediately when state crews opened two large flaps at the back of the tent to make more room for the overflow crowd. Ohio Department of Transportation Deputy Director Thomas O'Leary adequately echoed the sentiments of many, calling the new road the "best Christmas gift we could have given Wayne County." The Wayne County project and others like it across the state have been made possible by Ohio's Jobs and Progress Plan. Unveiled in 2003, this ten-year plan is intended to “help rebuild Ohio's urbanized interstate network, address high-crash locations, and complete rural freeway corridors” such as U.S. 30. Through this same plan, the last gap of freeway which remains between Upper Sandusky and Ada will also also be constructed. When this 25-mile project is complete—possibly in late 2007—motorists will be able to travel on a four-lane limited access highway from Canton to Fort Wayne. East of Canton, only one project remains on the drawing board. This next phase of highway would extend the four-lane route three additional miles from Trump Road to State Route 44, bypassing East Canton and eliminating a pair of difficult right angle turns in that town. This project would add to a one-mile extension that was opened in the summer of 2000 between Belden Road and Trump Road. Unfortunately, all previous plans to build a new route from East Canton to Lisbon have been put on hold, and the prospect of having a four-lane version of U.S. 30 across the entire state has dimmed considerably in the first years of the new millennium. Upon the completion of each new project of U.S. 30, it will become increasingly enjoyable to drive the older historical sections which were, are, and hopefully, always will be remembered as the Lincoln Highway. The value of the highway as a linear tourist destination certainly became apparent in February 2004, when the state officially recognized the 1928 version of the route as the Lincoln Highway Historic Byway. Spurred by that most significant designation, the newly-formed Ohio Lincoln Highway Heritage Corridor kicked their activities into high gear, successfully tying small businesses and local chambers of commerce onto a common thread with events such as the annual Lincoln Highway Buy-Way Yard Sale. While others recognize the potential of this corridor for economic development and tourism, the Ohio Lincoln Highway League continues to follow the statement of purpose of the Lincoln Highway Association by promoting and preserving the public awareness of the nation's first transcontinental automobile route. This is best seen with the activities of the Mid-Ohio Chapter and Eastern Ohio Chapter, which meet on a monthly basis in their respective parts of the state. These local groups bring together good folks with a great variety of general interests—each with a specific connection to this historic highway that passes not only close to their homes, but also close to their hearts. Nearly every contemporary event that pertains to the Lincoln Highway in Ohio results directly from the efforts of individuals or groups who are members of the Lincoln Highway Association and its local chapters. It may be something as big as a state-wide yard sale, or it may be something as small as painting a Lincoln Highway logo sign. Readers who share a common interest in the promotion and preservation of the highway are encouraged to help us with these efforts by joining the Lincoln Highway Association. New members with Ohio addresses will automatically become members of the Ohio Lincoln Highway League, our state affiliate for the national organization. Membership information is included in the inside covers of this book.